Each spectrum image acquisition requires a survey image. It provides a frame of reference for the acquisition and serves as a useful reference image of where the data was acquired. You can only assign one image at a time as the active survey image. This image should be recently acquired and of a good quality. Images acquired with too short a pixel dwell time can result in inaccurate beam positioning and a mismatch of indicated and acquired spectrum image position. The survey image can be ether a recently acquired (static) image, or a still continuously acquiring image. The former might be preferred for beam sensitive specimen; whereas the second can be beneficial to avoid charging induced specimen drift at high magnification and to provide the most accurate survey image at the start of spectrum image acquisition. 1. Locate the region of the sample you are interested in. Use a dwell time of 16 ms/pixel or longer. The long dwell time ensures an accurate microscope beam position in subsequent analysis. Make certain that the region you wish to acquire is smaller than the field of view, typically about one third of the size. This allows the beam deflectors to correct for spatial drift and also ensures that the spectrum image (SI) region is well represented in the survey image. 3. 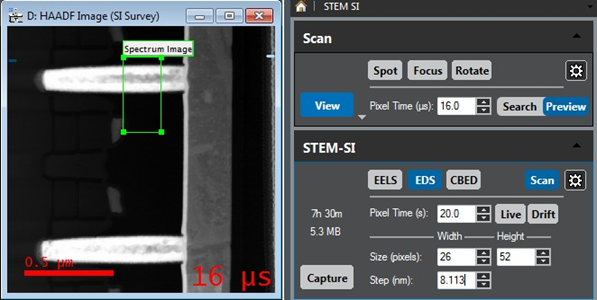 Select a SI mode on the STEM SI palette or use the survey region of interest (ROI) tool from the floating menus over the image. Either action will automatically assign the front more image as the survey image. The window title will change to remind you that this is now the current survey image. 4. Refresh the survey image. The current survey image is automatically de-assigned when a different survey image is selected. If you close an active survey image or remove all survey ROIs, the STEM SI palette will revert to the mode selection state. When a SI is acquired, a copy of the survey image is created on the SI data workspace. This image acts as data reference, which causes the survey ROI to no longer be moved or resized. Only the survey image on the View workspace is actively linked to the STEM SI palette and interactive.